There were no arrests after the post-fight melee which followed Conor McGregor's defeat at UFC 229 on Saturday night, Las Vegas Police have announced. 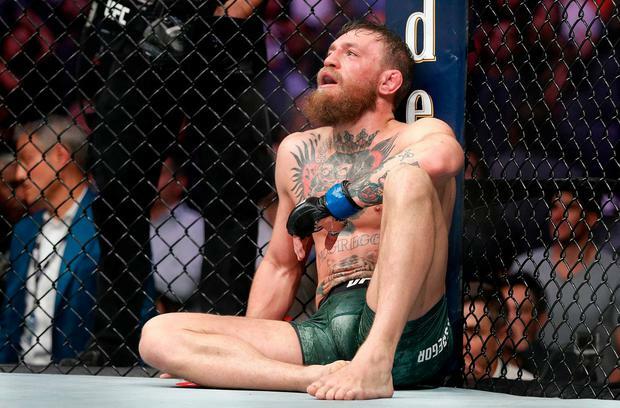 The 30-year-old tapped out midway through the fourth round against the undefeated Khabib Nurmagomedov, who then vaulted the cage and attacked someone from McGregor's camp, while the Irishman was set upon by at least two men who entered the Octagon. A statement from the Las Vegas Metropolitan Police Department on Monday read: "LVMPD officers assisted with breaking up several small fights that took place after Saturday night's UFC main event in Las Vegas. After all parties were separated, no one involved wished to press charges and no arrests occurred." McGregor was making his return to mixed martial arts after a two-year hiatus in an event which was billed as the biggest in the UFC's history. The duo's camps clashed in Brooklyn in April in an incident which saw McGregor throw a dolly at the window of a bus containing several rival fighters, including Nurmagomedov. The Russian retained his lightweight title with a career-best performance at T-Mobile Arena, but soured his night with his actions afterwards. UFC president Dana White said afterwards: "I've been doing this for 18 years and I couldn't be more disappointed." Nurmagomedov expressed regret at what had unfolded but showed his disdain for McGregor's behaviour leading up to the fight. He said: "First of all I want to say sorry to Nevada Athletic Commission and second to Vegas. I know this is not my best side. I'm a human being. McGregor has not spoken publicly about the incident but has expressed his desire on social media for a rematch with Nurmagomedov, who now holds a perfect 27-0 record in his MMA career. After saying he was "looking forward to the rematch" in a tweet on Sunday, the Irishman posted on Instagram the following day: "We lost the match but won the battle. The war goes on." The post was accompanied by a picture of McGregor sporting a black eye but looking relaxed holding a drink.